Type inference for generic instance creation. The try with resources Statement. The alternative before was to do with if else statements paired with a bunch of String equal() calls . The result much cleaner and compact code. 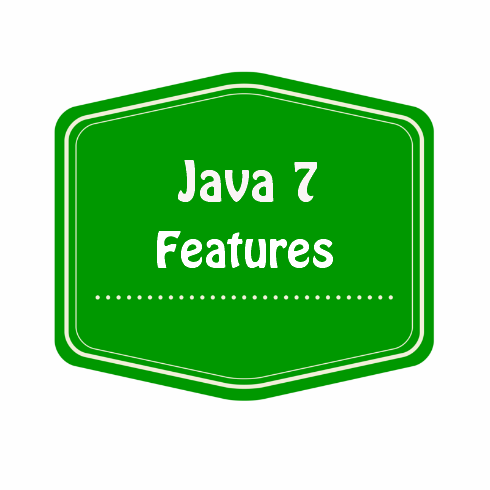 In java 7 you just use the diamond <> operator without the type. The new try statement allows opening up a "resource" in atry block and automatically closing the resource when the block is done. For example in the below piece of code we opened a file print line by line to stdout. But pay close attention to the finally block. when using a resource that has to be closed , a finally block is needed to make the clean up code is executed eve if there are exceptions thrown back. The new try catch with resources allows us to automatically close these resources in a more compact set of code. Tired of repetitive error handling code ? APIs like java.io and java.lang.reflect? multiple exceptions in a single statement separated by "|". int c = 0B101; // The B can be upper or lower case. Support for input output file. and to access default file system. 5.Bracket notation for collections: this is not working.